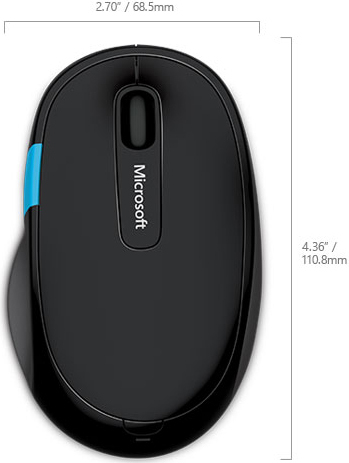 The ultimate Windows mouse - The blue Windows touch tab on Microsoft H3S-00003 Sculpt Comfort Mouse revolutionizes the relationship between hardware and software, providing quick and easy access to your favorite Windows 8 features. Quickly navigate to the Start screen and access apps faster. Press the center of the sleek blue tab to switch between your current app and the Start screen. Or simply swipe up on the tab to cycle through all of your open apps, or down to reveal all the open apps and select the one you want. Bring order to your busy days - The ease and speed of the Windows touch tab means you can get things done with precision and effortless control. Plus, Sculpt Comfort Mouse’s intuitive, modern design and high functionality make it the perfect complement to your Windows 8 experience. Stay connected on the go - Sculpt Comfort Mouse features Bluetooth connectivity, so you can easily pair your device with your PC or tablet and not worry about using cords or transceivers. As well, its BlueTrack technology works on virtually any surface. The right-handed thumb scoop design and Tilt wheel allow you to quickly and comfortably scroll left, right, up and down. Windows touch tab - Optimized for Windows 8, press the center of the blue strip to switch between your current app and the start screen. Swipe up on the blue strip to cycle through open modern apps, swipe down to reveal all the open apps and select the one you want. Also works in Windows 7: press to go to the Start menu, and swipe up or down to move forward and backward in your browser. Scooped Right Thumb for Comfort Grip - Ergonomic design for right-handed users makes extended use more comfortable. BlueTrack Technology - BlueTrack technology works on virtually any surface in your home or office. Bluetooth Connectivity - Wireless Bluetooth technology allows instant connectivity and frees up a USB port.